Abstract: EICMA, as one of the world's largest two-wheelers exhibition and holding a high reputation, will attract myriads of dealers, world known companies, scooter-lovers, customers, and other guests from all occupations to attend the long-anticipated event. During the event, three innovative and original products will be presented: Z3, M3 and S6 at Pavilion 24. Stand E53 from Nov 19th to Nov 22nd. Airwheel, as the leader in global portable intelligent transport industry, will show its latest achievements, self-balancing electric scooter Z3, M3 and S6 at Pavilion 24. Stand E53 from Nov 19th to Nov 22nd. We will get a sneak peek into the unique and innovative designs of its up-to-date intelligent electric scooters. Airwheel Z3, a self-balancing 2 wheels scooter, emphasizes on the details. For example, with the anterior standing design, it accords with principles of ergonomics, and changes the side standing which easily cause fatigue. Z3 will be with you rain or shine by virtue of the up-equipped battery design. 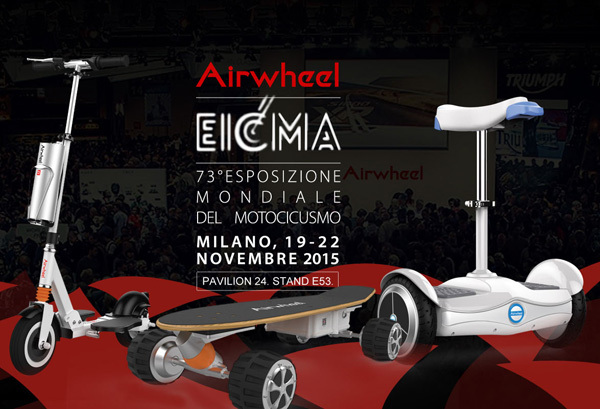 M3, the first electric skateboard in Airwheel family, makes the skateboard become a tool. TPU material damper mass on front and rear wheels ensures a smooth ride. The wireless variable speed remote control has condensed wisdom with small size, which can realize infinitely variable speeds, and the effective distance reaches 10 meters. It is worth mentioning that the optional and customizable board and paster gives you full play to your creation. A mini self-balancing scooter is Airwheel S6, mini yet extraordinary. The shining point of S6 lies in the various ways of riding. That is to say, you can stand or sit to ride which is suitable for a wider range of situations. PC materials, adopted to S6, are wear-resisting, scratch-resistant and resistance to chemical corrosion. There three scooters can be positioned by Mobile App which shows kinds of data. 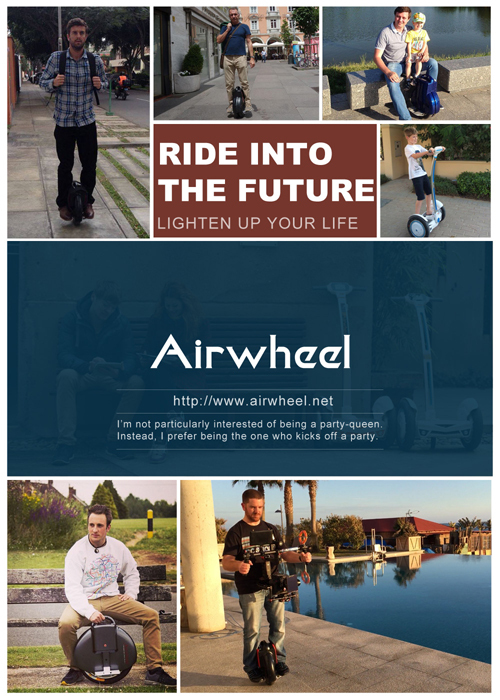 Apart from the newest vehicles, other widely enjoyed scooters will also show up, Airwheel X series Q series and S series included.